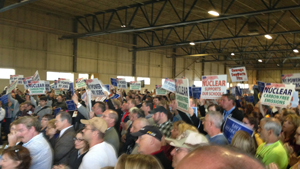 Employees of the Fitzpatrick Nuclear Plant in Scriba, New York joined local community members and government officials at a rally to express support to keep the facility open on Monday. The demonstration came after Entergy Corp., which owns the plant, said that the plant may not be refueled. Those in attendance at the rally included members of the International Brotherhood of Electrical Workers' local chapter; U.S. Reps. John Katko (R-NY) and Richard Hanna (R-NY); and members of the State House of Representatives, State Senate and the Oswego County Legislature. The facility supports approximately 1,000 temporary positions in the state during its refueling and has 650 permanent employees. The facility also contributes approximately $18 million in property taxes toward the state. Entergy Corp. has said that it will announce by the end of the month whether the plant will shut down. Want to get notified whenever we write about James A. FitzPatrick Nuclear Power Plant ? Next time we write about James A. FitzPatrick Nuclear Power Plant, we'll email you a link to the story. You may edit your settings or unsubscribe at any time.